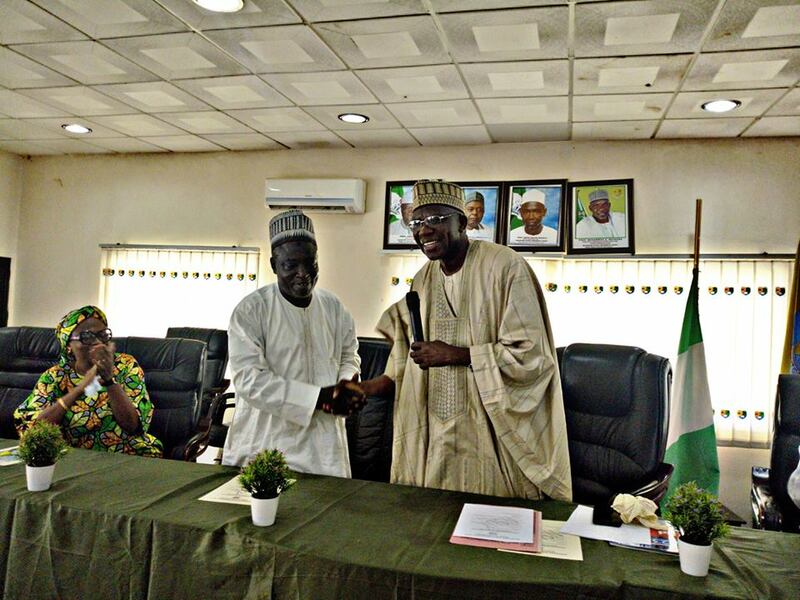 Prof. Suleiman Bala Mohammed Has Been Appointed Acting Vice Chancellor of Nasarawa State University, Keffi. 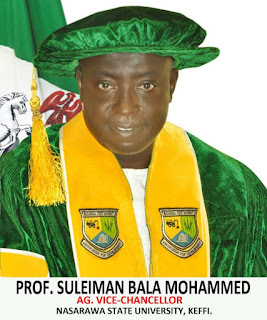 Prof. Suleiman Bala Mohammed has formerly assumed office as the Acting Vice Chancellor of Nasarawa State University, Keffi. At a brief handover ceremony held Tuesday, 9th October, 2018 at the Senate Chamber of the University, Prof. Suleiman Bala Mohammed paid special tribute to the outgoing Vice Chancellor, Prof. Muhammad Akaro Mainoma, for his outstanding accomplishments while in office. He promised to build on the success recorded by the Prof. Mainoma as well expand the existing achievements. Prof. Bala Mohammed also praised the efforts of the state government, under the able leadership of the Visitor to Nasarawa State University, Keffi, His Excellency Umar Tanko Al-Makura, the Executive Governor of Nasarawa State, in the improvement of quality of facilities which have resulted in Nasarawa State University, Keffi being one of the best universities in Nigeria. On some of the challenges facing the university, the Acting Vice Chancellor, said he is committed to tackling them heads on, while calling on the staff and students to lend him similar support in order for the institution to attain greater heights. Earlier in his speech, the outgoing Vice Chancellor, Prof. Muhammad Akaro Mainoma, said he was glad that the University has made great progress under his leadership, expressing joy that the appointment of Prof. Suleiman Bala Mohammed as the Acting Vice Chancellor is a right decision, describing him as someone who understands the university system very well. Prof. Mainoma outlined some of his accomplishments such as, increase in the number of NUC approved programmes, expansion and improvement in the infrastructure, increased visibility of the university resulting in the growth of the number of students from less 30,000 when he took over to 50,000 today. He also cited the stability of academic programmes, the welfare of staff and students, as well as the transparency of processes as legacies that he is proudly bequeathing. He assured the Acting Vice Chancellor of his cooperation within the period of transition to ensure smooth take off of the new leadership. Suleiman Bala Mohammed, a Professor of Political Sociology and Development, was appointed the Acting Vice Chancellor of Nasarawa State University, Keffi on the On 8th of October, 2018, by the Governor of Nasarawa State and Visitor to Nasarawa State University, Keffi, His Excellency, Umaru Tanko Al-Makura, following the expiration of the tenure of the former Vice Chancellor, Prof. Muhammad Mainoma Akaro. Prof. Mohammed was a Visiting Lecturer, Department of Sociology, Nasarawa State University, Keffi, (2014 – 2016), an External Examiner to several universities including Nasarawa State University, Keffi, Umaru Musa Yar’Adua University, Katsina, Ibrahim Badamasi Babangida University, (IBBU) Lapai and the Nigerian Police Academy, Wudil, Kano. He is actively involved in the development of his community of Laminga, where he is the Chairman, Laminga Development Foundation (LDF) 2012 – Date. He was also the Chairman, Nasarawa Emirate Committee of Academic and Medical Doctors, 2013 – 2015. On scholarly and academic publications, Prof. Mohammed has seventeen published journal articles, contributed six book chapters, twenty-eight conference papers and has edited and reviewed at least two journals.